Robert D. Lowe, 94, was born in Hutton, Louisiana in 1921 and attended school in Amite, La. Bob, as he is affectionately known by his friends, is a self-made man. After losing his father at the age of eight, he worked on the family farm before he went to school, milking cows and picking cotton. As a teenager he worked in the oilfields of Louisiana. During WW II, Bob enlisted in the United States Marines, and was stationed at Pearl Harbor with the First Defense Battalion during the December 7, 1941, attack by the Japanese. Upon returning home to Louisiana, Bob became a force in the oil and gas industry and owned several businesses including All American Development Company, Gulf Gate Marine and Central Industries. Bob is a compassionate person, always caring for his fellow man. Over his decades of service, he was involved in several major endeavors to reach out to those persons in need. He is a founding member of LARC (Lafayette Association of Retarded Citizens) and 232-HELP. Additional civic accomplishments include: 232-HELP Board of Trustees (immediate past president 2008-2012); Iberia Bank Board of Directors; longtime supporter of the United Way of Acadiana; Blueprint Louisiana Board of Trustees; Lafayette Civic Cup award in 2011; and Petroleum Club of Lafayette Board of Directors, 2014-2015. As a Pearl Harbor survivor, Bob is very active in the veteran community of Acadiana. Each year on December 7, he hosts a reunion of Pearl Harbor survivors at the Petroleum Club. 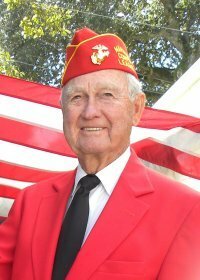 Bob is a life member of the Marine Corps League, Acadiana Detachment # 488; Executive Board member of the Veterans Action Coalition of Southwest Louisiana; and a member of Lafayette Central Park Veterans Memorial Foundation. At historic American Legion Post 69, Bob currently serves as Senior Vice Commander – for many years he served as Commander – and is on the Executive committee. In 2014, Bob sponsored the inaugural WW II Tribute Tour. Annually, he attends and supports the Acadian Museum's fundraiser in the Erath Community Center. Acadiana is very fortunate to have this man as one of its "native sons." We are grateful for this humble man's years of service and his many notable contributions to our community and culture.